• FH SERIES interchanges with Snap-Tite “H” Series. • FIH SERIES interchanges with Snap-Tite “IH” Series. same size will couple together. prefix BL to socket catalog numbers. The FIH Series sockets & plugs are for pneumatic applications. 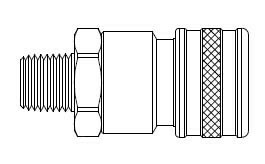 The FIH sockets have a valve with 360° contact with plug.